I'm one of the lead organizers behind Model Mafia, a growing network of over 200 fashion models building community and power, striving for a more equitable, just, sustainable industry and world. Are you a model interested in joining our next action? Email your name and agency to ModelActivist@gmail.com and join 200+ models who want to help build a more sustainable just society. Writer & Producer of Climate Warriors. 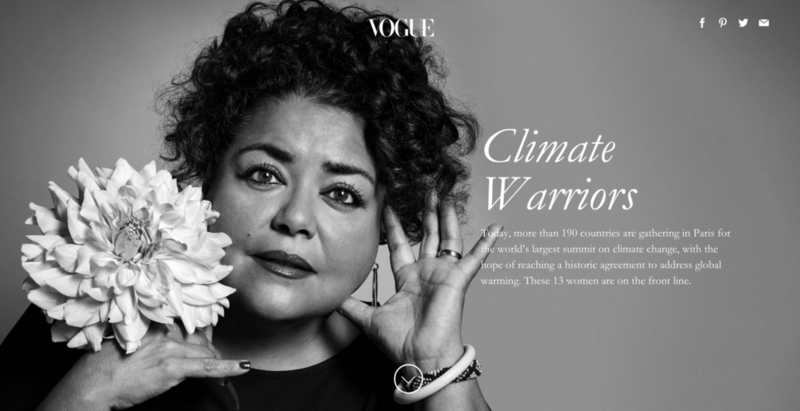 You might not recognize their names and faces yet, but the women in this series, photographed by Inez and Vinoodh for Vogue, are fighting to save the world. If we survive climate change, their names will be celebrated, they will have delivered us through our most challenging time. Founder & Director of Interrupt. We support a new editor-in-chief to take over each issue. We stopped publishing new content in Sept. 2014. We had 350,000 monthly readers. Some of our favorite articles are archived here. Interview New York - created a interactive public art project on a mission to interview everyone in New York City with the same three questions: What are you proud of? What are you afraid of?